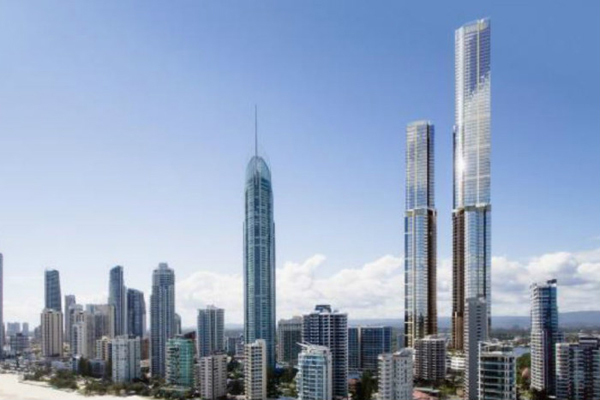 Residential towers in the Gold Coast continue to reach new heights as a development application for one of Australia’s tallest buildings is submitted. In the latest development, an application has been submitted for the Orion Towers Project involving two towers reaching 328 metres (Tower 1) and 274 meters (Tower 2) which will be linked together at the podium level by an elevated curved bridge. Designed by Woods Bagot, the new towers will accommodate a range of uses including food and beverage on the ground floor, a 165ky five-star hotel, residential apartments and a signature restaurant and observation deck at the apex. A key feature of the design revolves around horizontal gold plating which is intended to streamline the façade as it rises into the sky, becoming graduated from the lower floors to emphasise the curvature of the form. The inward-facing tower facades have an articulated geometry that directs the view outwards, designed to increase privacy for residents while creating an aesthetic that offers a distinct design element to the structure. The latest application comes as high-rise development throughout the Gold Coast continues apace. Already, the city is home to nine hotel, residential or commercial buildings of 150 metres or greater in height. This includes Australia’s tallest current standing building in the 321 metre (78 floor) Q1 resort and spa. Going forward, the Council of Tall Buildings and Urban Habitat lists a further twenty-two which are in the pipeline. As well as twenty which are in the vision or proposed stages, two which are currently under construction include the 89-storey Spirit 89 apartment complex which was approved last September and the 48-storey (170 m) Wanda Ridong Hotel. Despite being taller than Q1, however, the Orion may not be the tallest building on the Gold Coast once completed after the anticipated ten-year construction period. That honour may well go to the proposed 104 storey (335m) Imperial City Tower 1 residential building at Southport, which could be finished as early as 2019. With Q1, Imperial City and Orion, the Gold Coast is home to three of Australia’s four tallest existing or possible skyscrapers. Australia wide, however, the tallest building in the pipeline is in fact the 381 meter, 88 storey Bond Building in Sydney. Given that that building remains at the ‘vision’ stage, however, it is likely that the Gold Coast is set to remain Australia’s number one ‘hot-spot’ for mega building development for some time yet.